Digestion and the digestive process are considered of utmost importance in Tibetan Medicine and is a major focus of study. A weak or impaired digestion can lead to many chronic diseases. Although in Tibetan medicine each person is considered individually, there are also some general suggestions that we can all follow to maintain basic digestive health. In general we are advised to eat such that we imagine the stomach divided into four portions; two parts are for food, one part for liquid and the fourth part is left empty to give room for the food to be digested. This means that we might leave the table feeling not quite full which is considered the best for digestive health. Besides eating what might amount to smaller portions for many of us we are also reminded to not eat meals too closely together so that our stomach is filled before the last meal has time to fully digest. How often have we had the experience of eating a heavy meal loaded with fat and carbs and come away from the table feeling unwell? If we eat like this on a regular basis then our ability to fully digest and metabolise our food is damaged leading the way to many other disorders. 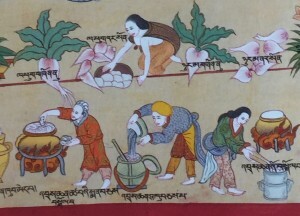 The first medicine noted in written chronicles of Tibetan medicine is hot boiled water for indigestion. Drinking hot water after any kind of heavy or oily food helps to break up and digest the fat. A cup of hot water with a pinch of salt taken in the morning can also help to break down mucous build-up in the stomach that blocks the pathways of digestion. Conversely regularly drinking water with ice can damage digestive heat. Types of food that we should avoid are foods that have sat around too long like vegetables that have been in the fridge for a few days, or food that is burnt/has a burnt smell, or undercooked. These are all considered to be heavy and difficult to digest. Over time these continued eating habits tend to harm our digestive heat. 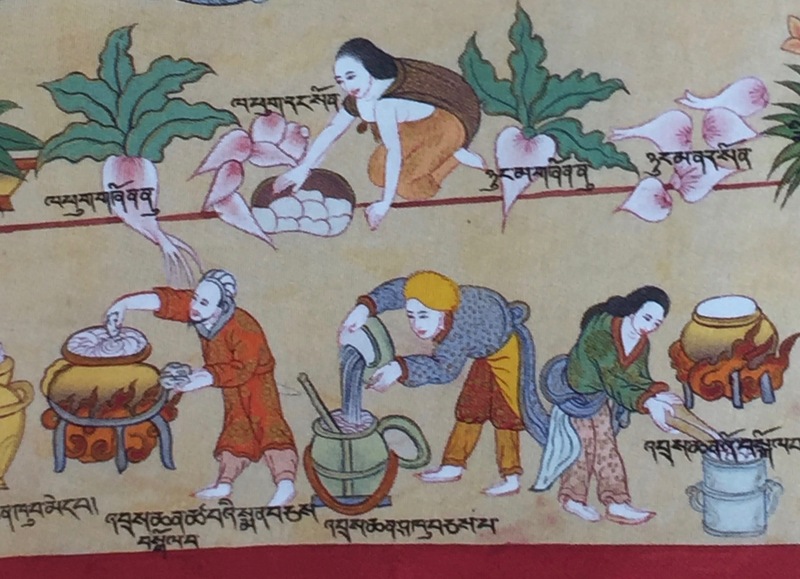 Another type of food to avoid is what Tibetan medicine terms ‘unnutritious or rough’ food, including unripe foods. One popular example of rough food may be the current trend to eat raw or uncooked food. Of course this is fine to do occasionally, a salad with a meal can be very healthful, but to only eat salads or raw juices can also ‘cool down’ the digestion and result in excess ‘rlung’. These are general guidelines which will change according to a person’s individual constitution, particular imbalances, the location and climate of where one lives and the season. These factors also determine one’s individual dietary needs or how a particular diet is tolerated. However eating fresh, nourishing, cooked foods, with lots of vegetables and fruit, easily digestible grains, eating healthful proportions, and drinking hot water will all benefit digestion and help to keep us comfortable and healthy.